Chilly weather is the perfect reminder to pick up a pumpkin. Why stop by the store, when you experience searching for the perfect pumpkin? There is nothing that matches the nostalgia of wandering into a field of orange, and retrieving the perfect pumpkin to carve. In Ventura County, there are no shortages of pumpkins to pick, and the fun is perfect for the whole family to enjoy. Maximize Experience: McGrath Brothers’ Pumpkin patch offers hay-rides, and Underwood offers a plethora of activities for all ages. This extra activity encompasses all of the things we love about fall! 3. 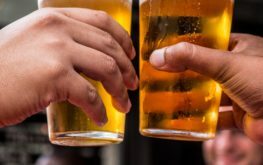 Go to an Organic Brewery – Leashless Brew Co. Searching for a new, organic craft brewery to try? Even though they’ve been around for a little over a year, Leashless boasts bold offerings, all with keeping everything organic. With that, they ask that you abide by their non-smoking and non-styrofoam policies. In efforts to help the environment, they ask for smokers to either refrain or deposit their butts in designated areas, and ask their patrons to not bring in any food with styrofoam containers. Come on by for great beer, and even better atmosphere! 5. VooDoo on the Bayou Voo-Do you dare to enter this haunted bayou? Simi Valley is offering 15,000 sq. ft. of thrilling maze that will test your mind to its limits. This haunted maze is open for the remainder Friday and Saturdays in October, and their hours varies per weekend. Bring a gaggle of friends to stand up to what is making a boo in the bayou! Kid Friendly: Depending, ages to enter are 13 and up! Maximize Experience: Arrive early! The hours are already set to take place entirely at night, so make sure to arrive in time to park and stand in line to purchase tickets. 6. Painting with a Twist Another great indoor activity as the nights fall colder, is breaking out the brushes. Painting with a Twist allows you to create beautiful art, with the easy guidance from a resident-artist. The fun keeps flowing with their on-site wine and beer offerings. 7. Trick or Treating Maximize the spirit of Halloween this year! The Collection is hosting their annual Trick or Treat, with a fun twist; complete with a event passport and map that guides you around to different shops where you either receive a trick, or a treat. All those trick-or-treaters brave enough to complete their maps are entered to win a “spooktacular” grand prize! Maximize Experience: Purchase tickets online here to avoid missing out! Every trick or treater is required to have a ticket to enter. 8. Boo At The Zoo – Santa Barbara Zoo Don’t miss this years’ Boo At The Zoo, themed “Candypalooza,” hosted by Santa Barbara Zoo! Admission includes lots of activities, like: event entry, trick-or-treating, Zoo Train ride, carnival games, scare zone, animal scooter ride, dance party, animal encounters, performances, bounce houses, and rock wall climbing. Hours: October 19, 5:30–8:30 p.m. October 20, 4:30–8:30 p.m. October 21, 4:30–7:30 p.m. Maximize Experience: Buy tickets online early, to skip entrance lines! 9. Check out the fall foliage and sip a cozy drink all at once! Spending time outside among the changing colors and grabbing a seasonal drink is an easy and free way to celebrate fall this year. Ventura county offers multiple, year-round hiking trails and parks and exciting coffee houses that are ready to give you a flavorful fall beverage. Check out our recommendations below! 10. Fiesta Noche de Recuerdos On this “Night of Memories,” gather with those you love to join in remembrance this season. 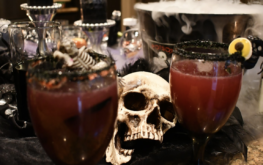 There will be specialty drinks offered, festivities, and Dia De Los Muertos altars set up to admire. Maximize Experience: Grab a cozy, warm drink to enjoy during the festivities!